Watching a plane from Parc du Chateau flying in for a landing at the Nice Airport in France. The Nice International Airport is a modernized airport and is rated the second largest in France. Flights are scheduled daily from Nice on return trips to America, most European cities, North Africa and other French cities. The airport has two separate terminals, one for international flights and one for European and French flights. Nice Airport, Parc du Chateau, Riviera, Provence, Cote d'Azur, France, Europe. 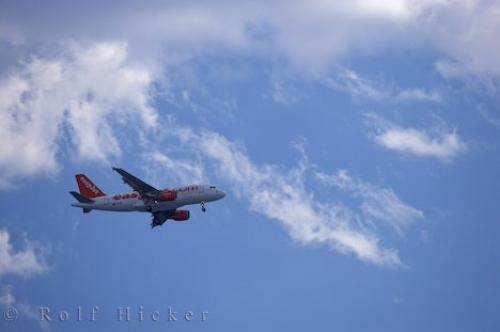 Photo of a jet flying through the blue skies in Nice, France preparing to land at the airport.